The festival with the longest tradition in Slovakia is the international contemporary dance festival Bratislava v pohybe (Bratislava in Movement). Its roots reach back to the festival of the same name (Bratislava en mouvement) organised by the French Institute in Bratislava. Significant names of French contemporary dance always performed there. In 1996 following the establishment of the Asociácia súčasného tanca (AST) (Contemporary Dance Association), Miroslava Kovarova, the then President of the Association, was asked to continue the well-established tradition under the auspices of the AST. Since 1997 the festival has hosted many domestic and foreign performances. We can mention at least some of the most well-known names: Ivan Wolfe, SOAP Dance Theatre Frankfurt, Allyson Green, Julyen Hamilton, José Navas, Akram Khan Company, Charles Linehan and Ultima Vez Company Wim Vandekeyba. In addition, accompanying events have always taken place at the festival. These include workshops, theoretical lectures and site-specific projects. In 2002, the festival left its traditional structure – apart from the traditional presentation named Rozhovory tiel (Discussions of bodies), there was a special event dedicated to improvisation, which was attended both by performers and teachers; for example by Steve Paxton, Eva Karzcag, Lisa Nelson and Daniel Lepkoff. Since 2001 the festival has been organised by the civic association Bratislava in Movement itself. The festival (Four (+1) Days of Dance for You), organised by Štúdio tanca (Dance studio) in Banská Bystrica, is focused on the reflection of original works in contemporary dance of Slovak production and co-production. It is one of the key events both in the Banská Bystrica region and in the national scene of contemporary dance. The main idea of the festival remains the creation of a platform for confrontation and communication between the art scene and audience in contemporary dance. The 11th year of the festival in 2015 was cancelled due to the disapproval of Marian Kotleba, the district governor of Banská Bystrica, with the activities of the festival, and because the funds from the Ministry of Culture for organising the festival were kept back by the Banská Bystrica Self-Governing Region. The international festival of contemporary dance and the movement theatre Nu Dance Fest was established by Petra Fornayova. The main organizer is the Contemporary Dance Association. The first year of the festival was held in 2006 as the result of an instant need to give Bratislava, which is the centre for current contemporary dance in Slovakia, a larger space for performing original Slovak works. Later, the dramaturgy was extended to foreign productions. The main aim, however, remains to present new, unconventional works and performances with a certain view and conceptual basis that are open to be perceived by the general public. A special event is the festival Hybaj ho!, which was first held in 2007. It is the presentation of Slovak contemporary dance in Prague. 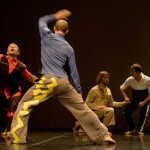 In 2008, it was organised as a presentation of Czech contemporary dance in various cities in Slovakia. The organizer is the Czech civic association Altar, the founder is Lucia Kasiarova. In 2013 as part of EHM Košice an international festival of contemporary dance New Dance Days was established. The co-initiator and the major artistic director at the beginning was Zuzana Hajkova. We can find famous and well-established names of the European dance scene as well as the production of local artists within the dramaturgy. Contemporary dance can also be found at the festival Kiosk held at the Žilina Train Station. The summer festival of ‘other’ Slovak theatre for a daring spectator is an activity originally initiated by the Theatre Institute that later developed into the form of a festival and since 2008 it has been the home product of the Station.